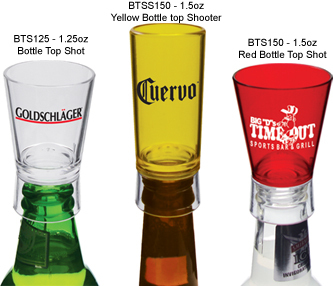 Custom-Imprinted Plastic Shot Glasses, Shooters, and Stemware: Choose From Many Shot Glass and Shooter Colors! 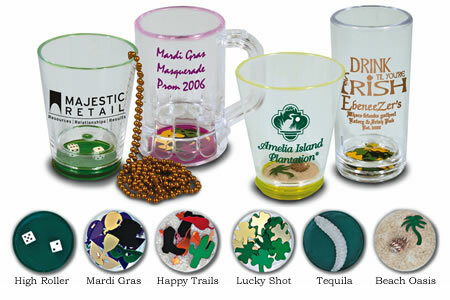 Custom-Imprinted Shots, Shooters, Reverse Bottle Shot Toppers, and Mini Stemware Samplers, Including Hanging Variations! 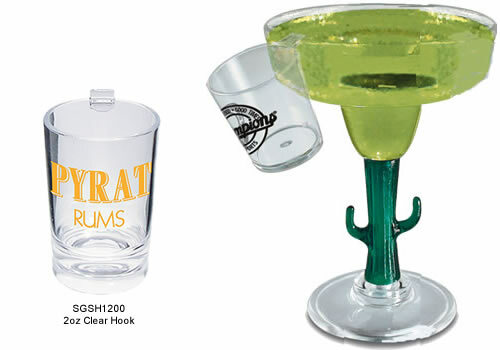 Our selection of Plastic Shots, Shooters, Reverse Bottle Shots and Samplers is perfect for bars, restaurants, clubs, fraternities, sororities, promotions, and much more. Our Colored Shot Glasses, Hanging Shots, and Shot Toppers add a unique and fun touch to any event. A wide range of glass and imprint colors are available. SG3125 1.25oz Shot Glass .71 .57 .51 .48 .46 .43 1.25" 1.25"
SG6150 1.5oz Shot Glass .71 .57 .51 .48 .46 .43 1.375" 1.375"
SGV4150 1.5oz Votive Shot Glass .85 .73 .69 .65 .63 .61 .875" 1.125"
SG1200 2.0oz Shot Glass .77 .61 .57 .55 .53 .51 1.5" 1.5"
SGT1200 2.0 oz Tapered Shot Glass .79 .63 .59 .57 .55 .53 1.375" 1.375"
SGF1200 2.0oz Fluted Shot Glass .87 .71 .67 .65 .63 .61 1.375" 1.375"
SGQ1200 2.0 oz Square Shot Glass .87 .71 .67 .65 .63 .61 1" 1"
SGFQ1200 2.0 oz Fluted Square Shot Glass .87 .73 .69 .65 .61 .59 1" 1.25"
SGCS1200 2.0 oz Shooter Glass .99 .85 .81 .77 .73 .71 1.5" 2"
SGC1350 3.5 oz Shooter Glass .85 .73 .67 .63 .59 .57 1.5" 1.5"
SGH1150 1.5oz Clear Hook Shot .77 .63 .58 .54 .49 .45 1-½" 1-½"
SGH1200 2oz Clear Hook Shot .77 .63 .58 .54 .49 .45 1-½" 1-½"
SGSH1200 2oz Clear Hook Shooter .97 .77 .71 .69 .67 .63 1-½" 1-½"
BTS125 1.25oz Bottle Top Shot 1.05 .97 .93 .87 .85 .79 1-¼" 1-¼"
BTS150 1.5oz Bottle Top Shot 1.05 .97 .93 .87 .85 .79 1-3/8" 1-3/8"
BTSS150 1.5oz Bottle Top Shooter 1.05 .97 .93 .87 .85 .79 1-3/8" 1-3/8"
It's easy to get started with your Custom Shot Glasses - simply call 1-800-233-0828, and then e-mail your camera-ready artwork to graphics@kardwell.com (you can also mail your design). Production time is about three weeks. Rush delivery is available for an additional charge.